My Travel Virtual is based around the real My Travel. You may not have heard of My Travel before as it is the new name of Airtours. We still use some unpainted Airtours aircraft. My Travel's main hub is in Manchester and we travel all over the World to destinations like Ibiza, Tenerife and Cyprus. We also do long haul routes to Florida and the Caribbean and Brazil. We have a fleet that consists of A320's, A321's, A330's, B757's, B767's and DC-10's. 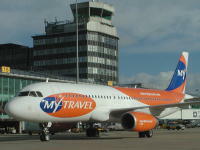 The new colours being displayed on this A320 at Manchester.